Keep your air at a nice comfortable level with this heated CPAP tube. Helps reduce rainout and makes your CPAP usage much more comfortable. ResMed also released a "For Her" model that features a light feminine touch by adding magenta to the mask instead of blue. Besides the color, all features of this women's full-face CPAP mask are the same. ​ResMed took what was the best part of the AirFit 10 and made it even more comfortable and less prone to leaks. Its basic shape looks the same, but there are some subtle differences that add up to some nice benefits. ​First, they brought back the polished silicon surface of some of the earlier masks. This sticks to the skin better and keeps the mask from slipping. There will also be fewer leaks. ​The part of the cushion that sits on the bridge of the nose has the same frosted silicon of the AirFit, so it sits much more comfortably at the spot where many people feel the most discomfort. They modernised the cushion with InfinitySeal technology which adapts and molds itself to the contours of your face, making it a unique fit for whoever is wearing it. ​The cushion is also built to last longer than its predecessor. Cushions would need to be replaced eventually when the silicon would begin detaching from the more solid part of the cushion. You may not notice it right away, but the spot where the pad attaches to the rest of the cushion is much more sturdy. It will eventually pull away and detach, needing to be replaced, but it will just take longer for that to happen, thus saving you money. There are three sizes: small, medium and large. The frames are all the same size so only the cushion needs to be fitted for your face. Finding the right size for your face is easy since ResMed provides a sizing guide for the mask​.​ Click here to view the sizing guide. ​Have you ever felt an itch on your nose in the middle of the night and needed to tear off your mask to get to it? I’m guessing that has happened to just about everybody who wears a full-face CPAP mask. ​By the time you get your mask off, scratch your itch. readjust the headgear, and snap it back on, you are wide awake. ​Now, unhooking your mask is literally a snap. The clasps are high strength magnets that simply snap together as soon as the connections are close. You don’t even need to feel around to find the other end. Unhooking them is just as fast. You just pull them apart, and your mask is undone. ​With this technology, you never have to readjust your headgear again since you don’t need to loosen it to get your mask off. ​Now, I know what you’re thinking. If it’s that easy to unhook the mask because it is just magnets holding it together, won’t it come undone at night? Well, no. With the way the magnets actually fit together combined with how strong they are, you won’t need to worry about your mask coming undone. ​Those old clasps were prone to breaking once your mask had been worn for a while. They weren’t the easiest things to unclasp and re-hook either. If you suffer from arthritis, you surely can see the huge benefit to having these new magnet clasps. I do have one word of warning. If you use a pacemaker or defibrillator, you need to make sure that the magnets are kept at least 50 mm away from the device. The magnets are strong and may interfere with the device. ​The frame itself will look very familiar if you have previously used any of the AirFit models. You may notice that it has a slimmer profile. This has obvious benefits when it comes to comfort, and it also makes it easier for those side sleepers. ​There still is no forehead support to the relief of those who wear glasses. Your upper face is unobstructed for better range of vision. ​The bigger changes happened to the elbow and diffuser. ​The elbow has different clips that are much easier to undo. They are easier to locate and are made of a more sturdy plastic than the flimsier version of the AirFit 10. Getting up in the night doesn’t mean taking your entire mask off. Just unclip the elbow, and you are on your way. The slim profile of the frame means you have a better range of vision. You won’t be stumbling around because you can’t see past your mask. ​ResMed has also decided to go back to the more sturdy plastic that they previously used on the elbow. This sturdier plastic makes it more durable and longer lasting. ​The diffuser is now quieter than the previous version which makes it the quietest diffuser on the market. The pattern is a bit different with more holes that are even smaller than they used to be. When you exhale, the air pressure can escape the mask much easier with a lot less wheezing. ​Q: I am a side sleeper. Can I use this mask? ​A: Yes. The slim profile makes this a great choice for those who need a full-face CPAP mask and are side sleepers. The unique design of the frame and cushion mean that, for most side sleepers, the mask will stay put and not leak. If you do find yourself with some leaks when using the mask, consider buying a CPAP pillow for side sleepers. ​Q: Can I travel with the AirFit F20 CPAP mask? ​A: Absolutely. 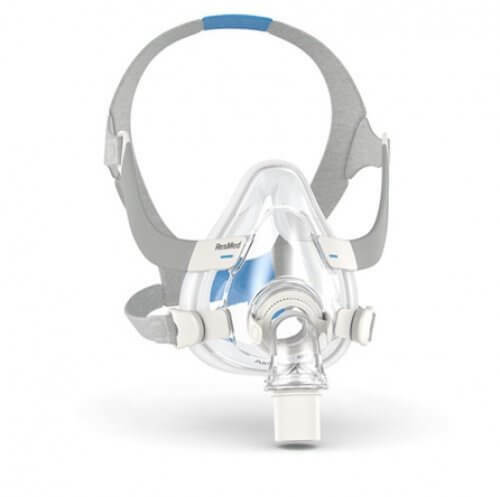 The AirFit F20 CPAP mask weighs only four ounces with the headgear and frame. It is small and won’t take up much space in your luggage. ​Q: How do I clean my CPAP mask? ​A: The easiest option is to use the SoClean 2 CPAP Cleaner Machine. However, to manually clean it, follow these tips. You should wipe your mask down each day with special CPAP mask wipes. Pay careful attention to the parts of the cushion that come in contact with your skin. Wiping the mask down with the wipes will remove the grease and dead skin and ensure a proper seal. Once a week, you should wash the frame and cushion as well as your hose in warm soapy water. Q: I use a high pressure therapy for my sleep apnea. Will this mask work at high pressure? A: The AirFit F20 is the best full-face CPAP mask on the market and not just because of the comfort. You can use this mask effectively with any pressure setting your doctor prescribes. Q: What type of hose will fit the AirFit F20? A: Any standard sized hose will fit. Check out the hoses at ResMed. Do you need to upgrade your CPAP mask and try the AirFit F20? Hopefully, this ResMed Airfit F20 review helped make your decision but, if you still have some concerns, read more information below. Are you not getting the full benefit of your therapy because of your mask? Is it because your mask is uncomfortable? If you answered yes to either of those questions, it is time to reconsider the mask that you are using. Sleep apnea patients who aren’t seeing a benefit from their therapy overwhelmingly report that it is due to the discomfort of their mask. ​What happens is that a poor-fitting mask is not comfortable. When your CPAP mask is uncomfortable, you don’t use it. When you don’t use it, you continue to suffer with your sleep apnea. ​An astonishing 97% of patients who tried the AirFit F20 reported a better fit, regardless of facial structure, gender, or age. ​If you are having trouble with your mask, you owe it to yourself to at least try the AirFit F20 and see if it is an improvement. ​There are absolutely no faults with this CPAP mask. The only reason somebody might be unhappy with it is because they don’t prefer or need a full-face CPAP mask. For those people, they are better off with a nasal mask or nasal pillows. ​If you need a full-face CPAP mask and have had trouble finding the right fit, well, I think your search is over. The cushion should just “pop off” from the frame and a new one will just pop right in. It is one piece and can be bought as a replacement as a whole, not just the cushion part itself. Let me know if you still need help! I run at 19cm of h2o and I have to crank the mask down pretty tight to get a good seal, I’ve been using a nasal mask for appox 10 years and a full faced mask is a whole new world to me. I get alot nasal flutter right where my nose enters my tote I think I might need to the large sized cushion? But it seems like the medium-sized cushion fits me perfectly. But the fluttering keeps me awake. But Other than that I love this mask it holds a good seal. I think it will just take me time to get use to it. And if stops my dry mouth it’s worth the trouble and time to get use to it. I just finished my 2nd night with an F20. In general, the mask is a big improvement over the F10, but I’m still having serious air flutter at the 11 and 1 o’clock positions. My sleep study showed SEVERE sleep apnea, so I have to use 22/18 and the mask works perfectly up to about 95% of the way to the top pressure, and then the trouble starts. I found that using a 2″ wide Velcro strap can cinch the mask down tightly enough to eliminate the leaks. BUT ….. after two consecutive nights I found the upper part of the bridge of my nose is VERY sore and red. I put a Band-Aid over it as a partial cushion but that didn’t help much. Because of the pain and discomfort, I really don’t think I can continue with this mask. I guess I’ll be going back to the P10 pillows.